For centuries, herbalists from around the world have prescribed dandelion root tea for ailments as diverse as indigestion, boils, and breast disease. Could this humble plant have a place in our modern pharmacopeia? Modern research suggests that there may be much more to this common weed than previously thought. Dandelion root tea is used in a number of cultures as a general liver tonic. It is therefore prescribed as treatment for disorders traditionally associated with a faulty liver, such as skin problems, constipation and headaches. 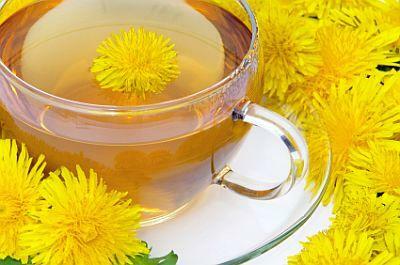 Western herbalists tend to focus on the herb's diuretic and bile-stimulating effects, and recommend dandelion to treat water retention, prevent kidney stones, stimulate the appetite, and improve digestion. In addition to these benefits, current research indicates that the active compounds in dandelion roots may have applications in some distinctly modern, lifestyle-related disorders. A 2008 Korean study compared the effects of dandelion extract and the prescription anti-obesity drug Orlistat. Orlistat works by inhibiting the pancreatic enzyme responsible for fat digestion and thereby preventing the absorption of dietary fat. In this study, researchers found that dandelion extract inhibited enzyme activity approximately 90 percent as effectively as Orlistat, and that a single oral dose of the extract significantly reduced blood lipid levels after fat consumption. Orlistat is associated with a number of unpleasant intestinal side effects and is generally only prescribed as a last resort for weight loss. It is possible that with such a high degree of efficacy, pure dandelion extract may result in similar side effects. Dandelion tea, however, contains the same compounds present in the extract, but in a much less concentrated form. In theory, tea from dandelion roots and leaves may offer similar benefits, but in a milder, gentler form without the unpleasant side effects. According to a study published in January, 2010, dandelion root may have a protective effect against the formation or progression of atherosclerosis. Excessive consumption of cholesterol is known to play a role in the disease, and it is believed that the oxidation of cholesterol in the bloodstream may bring on arterial plaque deposition. Because dandelion flavonoids have both antioxidant and cholesterol-lowering properties, researchers speculated that dietary intake of dandelion roots and leaves may prevent atherosclerosis. After four weeks of treatment, researchers found that test animals who received supplementary dandelion leaf or root powders together with a high-cholesterol diet showed improved blood lipid profiles, increased antioxidant levels and reduced arterial plaque deposits compared to animals who received no dandelion supplements. Based on the results of this study, it is not unreasonable to infer that dandelion tea may offer protection from atherosclerosis. To prepare your own dandelion root tea, gather as many roots as you require from a clean, uncontaminated source. Wash the roots thoroughly and hang them in a cool, dark place to air dry. Once the roots are dry, break or grind them into coarse pieces. Use one to two teaspoons for each cup of hot water. Place the root pieces in a tea ball or directly into the hot water and allow to steep for five to ten minutes. Begin by drinking one cup of tea daily, and gradually increase dosage to up to three cups per day once you have established how your body reacts to the tea. Store unused dried roots in an air-tight container in the refrigerator or freezer to maintain freshness. As with any herbal or pharmaceutical product, be alert for adverse reactions when you first begin using dandelion tea. Side effects are rare and usually mild, but allergic reactions may sometimes occur. If you are allergic to ragweed or other members of the aster family, such as echinacea or chamomile, use extra caution and consult with your doctor before using dandelion tea.